Update: Jagalena was able to have surgery and is doing well at home. Thank you for all that kept her and her family in your thoughts and prayers and donated to help. Meet Jagalena, a beautiful bridle mastiff weighing 138 pounds. Along with her giant breed size as lovable and gentle as she is also come large size veterinary bills. She is facing her first hardship in her life journey . A noticeable lump behind her shoulder has been diagnosed as a soft tissue sarcoma…..a common type of cancer in dogs. Dogs with cancer can be very similar to human cancer in the method of treatment and care, not to mention the findings help in finding measures to best treat or hopefully create cures someday. 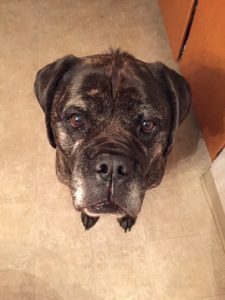 For Jag, her vet found her to be very alert, enthusiastic, responsive, showing a clear abdominal ultra sound with normal heart and lung functioning with no apparent physical difficulties. Her vet considers her a good candidate for immediate surgery to remove the tumor. She is as special as she looks. I have had Jag since she was 12 weeks old, and when asked if I have children I don’t hesitate to reply yes, but mine came with a tail. Jag and I live on our own on the small farm that I was raised on where she gets to have lots of freedom outside. Her favorite thing to do is go for rides and visit familiar drive throughs that she can be seen with her soccer ball size head hanging out drooling of course in anticipation. You see she has friends at the drive through of the bank, pharmacy , and Dunkin’ Donuts where she is always offered a dog biscuit and lots of attention from the workers. I am seeking financial assistance due to my monthly retirement pay being close to what her bills are adding up to when I don’t have that much to be short of . I’m seeking treatment at the well known research based educational hospital an hour from where we live which is Cornell University’s animal hospital. She’ll get the best option for treatment with a team of specialized doctors . She means the world to me and she deserves to have me do my best in seeking ways to help these funds. I’ve done my best to research her condition and possible financial assistance opportunities like being part of Companion Bridge. 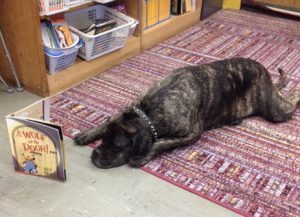 If you feel a connection to an elementary teacher that made your year memorable, mastiffs, Cornell, Upstate NY or you just smile when you see a dog enjoying their car ride and maybe they’re even anticipating a favorite drive through, this dog represents all of those, so please consider helping to support Jagalena. My appreciation would be huge like her and deeply felt. Thank you!